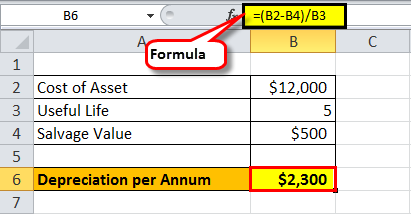 What is Straight Line Depreciation Method Formula? 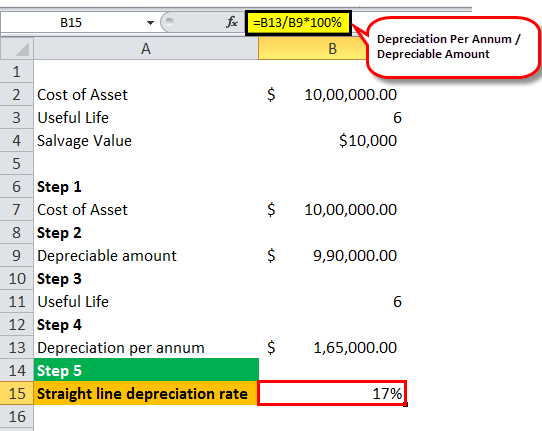 Straight-line depreciation method formula helps to evaluate the value of a fixed asset when the value of asset reduces periodically till it reaches salvage value. Straight line depreciation is a very convenient method and uses widely. 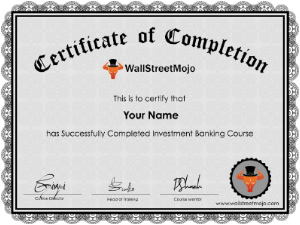 It is mainly used when there is no pattern when an asset to be utilized over time. 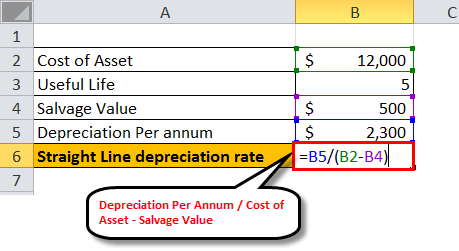 The formula for straight-line depreciation per annum is a cost of asset minus salvage value divided by the useful life of the asset. Cost of Asset= Purchase price of the asset. 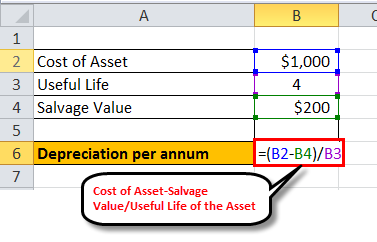 Salvage value= Value of the asset at the end of its useful life. The useful life of the asset= Number of periods of life of an asset. 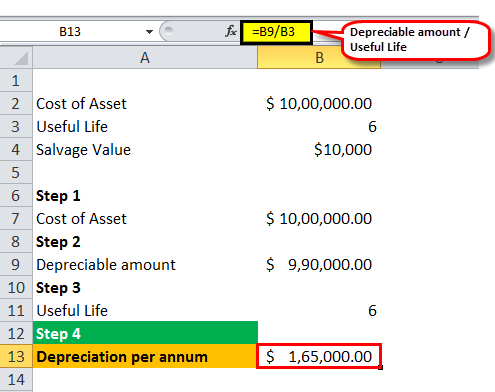 The rate of depreciation= in the single accounting period, it is the percentage of useful life. 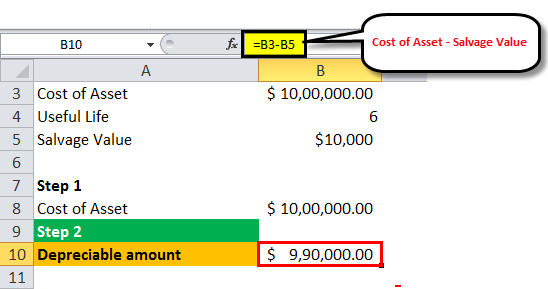 Determine the cost of the asset. 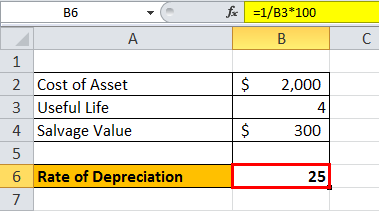 Find depreciable amount i.e. 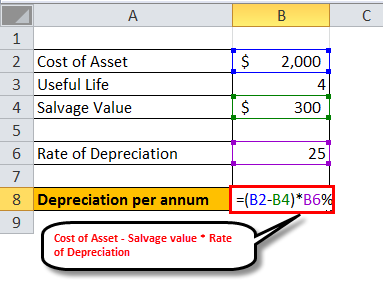 cost of asset minus salvage value. Determine the useful life of the asset. Divide depreciation amount by the useful life of the asset to get depreciation per annum. 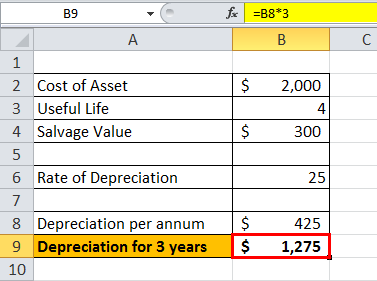 A company has fixed machinery, cost of the asset was $1,000 it has a useful life of 4 years and its expected salvage value is $200, assuming machinery purchase in 1st Jan’2011 and we are calculating depreciation value on 1st Jan’2013. 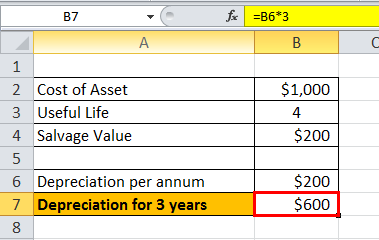 A company has fixed asset, cost of the asset was $2,000 it has a useful life of 4 years and its expected salvage value is $300, assuming machinery purchase in 1st Jan’2011 and we are calculating depreciation value on 1st Jan’2013. Suppose a company has manufacturing machines, cost of machines was $12,000 and it has a useful life of 5 years and its expected salvage value is $500, assuming machinery purchase in 1st Jan’2015 and Straight-line depreciation rate. A company name Helly Power has machinery, cost of machines was $1,000,000 and useful life of 6 years having expected salvage value is $10,000, machinery was purchased on 1st Jan’2012 now we have to calculate straight-line depreciation rate for same. 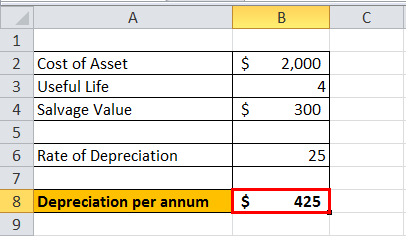 Step 4- Divide depreciation amount by the useful life of the asset to get depreciation per annum. Now let see its effect on the book of accounts. In the next 6 years, book value for machinery will be equal to salvage value considering depreciation. 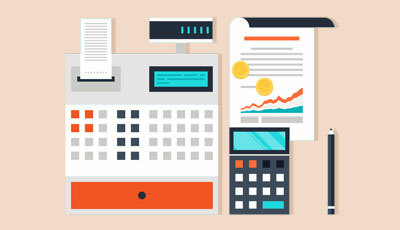 In account books, depreciation of the asset is recorded in depreciation expense account as debit and credit against it recorded in accumulated depreciation which is a contra asset account. Basically contra asset account reduces fixed asset account as these accounts are paired with fixed asset accounts. It has very fewer chances of error. It is used when there is no pattern to find depreciation value. 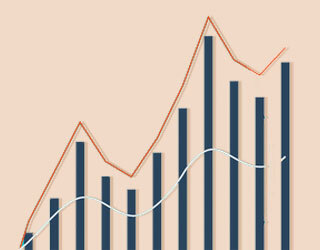 It will not have an impact on profit and loss statement because the straight line depreciation method does not impact profit and loss as asset depreciation is uniformly distributed. 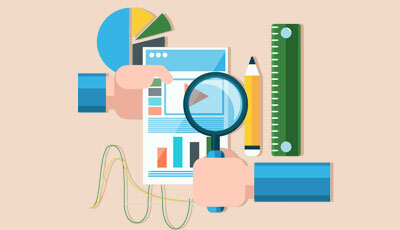 Its primary work is to find depreciation of fixed assets. 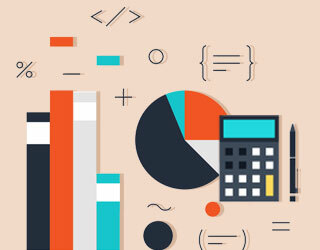 Depreciation is an important factor to be considered in accounting to get complete details of revenue generated by the company and it gets an actual financial condition of the company. In straight-line depreciation, it is assumed that depreciation of the fixed asset is uniform over its useful life. 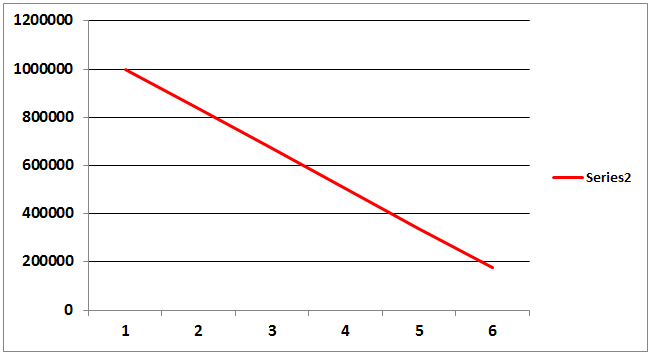 Straight line depreciation method is used as it can be applied for a long term and it is very easy to use. There are a few problems with this method like it will give approx. value, not an accurate one as it will have few errors and it will not reflect an accurate difference in usage of an asset. But still, it is a highly recommended method to find depreciation value of a fixed asset. 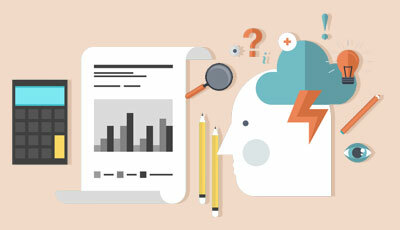 What do Asset Accounts tell us?